The recent California drought is considered to be the state’s worst ever, based on over 100 years of records. Unfortunately, this is only one drought in a years-long series (2007-2009 and 2011-2017) of droughts that have faced the Golden State. These droughts have been making headlines for decades, leading to a flood of information regarding the complex issues accompanying the ongoing crisis. Despite–or perhaps because of–the immense coverage, many remain confused about the current status of California’s water problems and who is suffering the most. Enter Water Deeply–an online water outlet–whose investigative reporting sheds light and clarity on many of these complex topics. Their extensive project–Toxic Taps–focuses exclusively on California’s safe drinking water crisis. Through news, in-depth analysis, and expert interviews, they have created a multimedia trove of information on the water crisis of the American West. 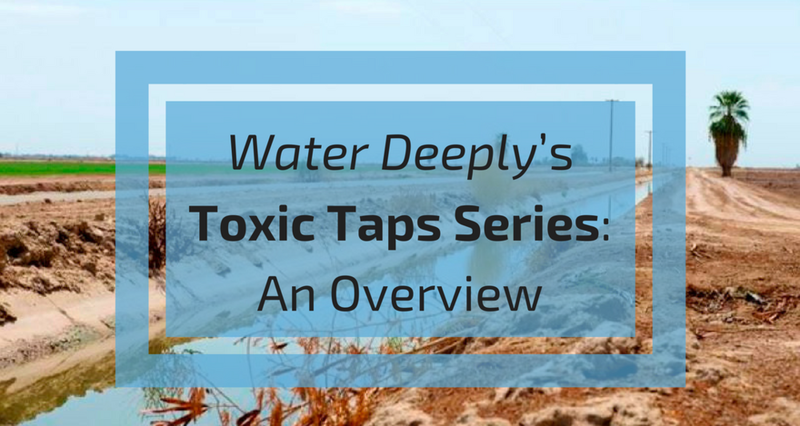 We reviewed the Toxic Tap series to provide you with a brief overview the current state of water in California. What Areas Are Most Affected by the California Droughts? Water Deeply investigates California communities hit hard by drought over the past decade. From affluent areas like Napa to disadvantaged communities in the Central Valley–nearly every area has suffered the consequences in one way or another. However, no region has been hit quite as severely as the San Joaquin Valley. We take a closer look at just why the San Joaquin Valley faces such obstacles. What Does a Drought Mean for Water Quality? The San Joaquin Valley suffered drought impacts in two major and catastrophic ways. Drinking water supplies dwindled and water quality deteriorated. One of the largest culprits of water supply reductions is “groundwater over-drafting.” Put simply, this means that water is used faster than it can be replenished. The San Joaquin Valley has more productive farmland than (local) water supply can irrigate, making the region especially vulnerable to overdrafts. For the past three decades, groundwater overdraft has accounted for approximately 13% of net water use. As a result, crucial drought reserves have been depleted. At the same time, the quality of water declined or remained poor for many households. This is in part due to persistent underfunding these (primarily Latino/Latina) communities and in part due to San Joaquin Valley’s intensive agricultural industry. The Valley is home to California’s $47 billion-a-year agricultural industry. It is also home to some of the United States’ most contaminated drinking water. This is not mere coincidence, as pesticide and fertilizer runoff from farms to watersheds are the main culprits. Agricultural pesticides–in extensive use for decades–compound naturally occurring elements (like arsenic), resulting in toxic groundwater supplies. How Do Water Systems Cope with the Consequences? The heavy reliance on contaminated groundwater has left San Joaquin Valley searching for drinking water solutions for years. Unfortunately, the area's water problems are compounded by the fact that much of the region is categorically defined as disadvantaged, or very low-income. This means that existing infrastructure and resources (technological, political, and/or financial) are often inadequate to tackle the massive problems they face. In general, smaller drinking water systems are particularly vulnerable to the problems that accompany drought conditions. Indeed, 76% of drought impacted systems across the state were considered small (less than 1,000 connections) according to the Pacific Institute. Because they have fewer customers, these systems have a smaller financial base to fund infrastructure upgrades. While emergency grants, low-interest loans, and technical systems are available, these efforts are generally slow to come about and do not necessarily lead to sustainable solutions needed for such large scale water challenges. Unfortunately, as Toxic Taps highlights, environmental racism plays an enormous part of San Joaquin Valley’s story. In fact, numerous studies demonstrate that race frequently predicts whether or not you live near pollution (water contamination included). As the series illustrates, oftentimes the problems of poor communities or communities of people of color go ignored and unresolved. This means that people who can afford to drill deeper, do so. It also means that those who can’t afford to drill new wells (like the small communities in the San Joaquin Valley) end up without drinking water. Legislative changes are required if the San Joaquin Valley is to have long-term, sustainable solutions to their drinking water crisis. The drought did kickstart a line of funding in 2014 via Proposition 1, which allocated $7.5 billion for water projects, including $260 million specifically for drinking water. Additionally, Senate Bill 88–which was passed in 2015–gave the state authority to consolidate small water systems with bigger neighboring ones. A proposed bill in 2017, Senate Bill 623, would have created a safe drinking water fund within the California State Treasury. Struggling public water systems would have been able to tap into this sustainable finance option without having to increase their water rates. Unfortunately, the bill failed. There is still a long way to go and the story is still unfolding. So, stay tuned to the Water Deeply's Toxic Taps series and keep learning about the ongoing California water issues. © SimpleWater 2014-2018. All Rights Reserved. | Test Your Water With The Tap Score Home Water Test.